NEW Lubrita grease - product lounched! Lubrita Research and Development (R&D) technical department together with industry experts introduced new Lubrita grease specially developed for Forest and Agri machinery. We introduced special grease for Harvester Head lubrication for timber-forest-wood industry, which shows very effective results. LUBRITA WR OH GREASE RED is an anhydrous calcium thickened lubricating grease based on a mixture of mineral oil and polymer. The grease contains antioxidants, corrosion inhibitors and EP (extreame pressure) and AW (anti-wear) additives. The thickener, together with the special base oil blend, makes the product suitable for the lubrication of heavily loaded parts and in wet and corrosive environments. The lubricating grease has excellent adhesion and water resistance. 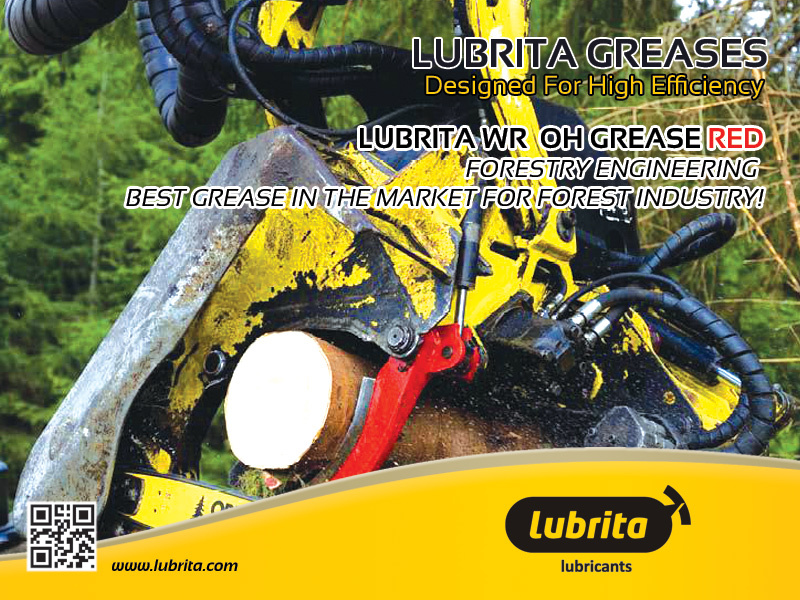 LUBRITA WR OH GREASE RED is especially developed for harvester head lubrication, marine applications and as an universal grease for forestry, agricultural and construction vehicles. The product is also suitable in industrial applications where water washout and corrosion are problematic. The grease is easily pumpable in most of the modern centralised lubrication systems despite of its high base oil viscosity. LUBRITA WR OH GREASE RED recommended for lubrication of pin and bushing assemblies, hydraulic linkage pins, pivot pins of costruction and logging machines, as well agricultural machines and equipments.